This manual is “the resale bible” for second-hand shop owners. The current edition contains over 200 pages in 12 chapters and is in its 6th printing. 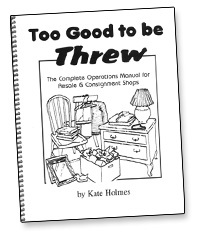 The guide was written by resale industry “guru” Kate Holmes. Kate, the former owner of “One More Time” consignment shop in Ohio, has over 30 years experience in this industry. Kate shares her profound knowledge in this guide. She was the previous director of the National Association of Resale & Thrift Shops and currently educates shop owners with publications, speaking engagements, and through her industry website. Great for both new and seasoned store owners! This guide covers literally every aspect of running a resale store including: startup, buying outright, consignment procedures, contracts, selling, creating effective displays, bookkeeping, hiring staff, preventing shoplifting, effective advertising, store layout, dealing with difficult consignors, growing your business, and much, much, much more!!! The guide is perfect for both new store owners and those experienced resellers who want to see their profits grow. Consignment fees? Buyer’s fees? Preferred Consignor Club? Will all sales be final? Should they be? Speeding up intake. Switching seasons profitably. Too Good to be Threw, “The Complete Operations Manual” is the best investment you can make in your business. Our readers have nicknamed it "the resale bible". . . and we are proud to offer it again in the new, updated, 21st century version! Visual Horizons Software is proud to offer you this one-of-a-kind manual to ConsignPro customers at our cost of $75 + shipping. If you’re not completely satisfied, simply return the guide (in new condition) within 30 days for a full refund of your purchase price. To order “The Complete Operations Manual”, simply call us toll-free at (888) 721.9767 or order online on our secure order web page.